The SHAC 7 were convicted on “animal enterprise terrorism” charges for campaigning to shut down a notorious animal testing lab, Huntingdon Life Sciences. The SHAC 7 is a landmark First Amendment case that will test how far the government can push “terrorism” rhetoric in order to pursue a political agenda and silence speech.. The case was heard before the Third Circuit Court of Appeals, and it is now pending before the Supreme Court of the United States. 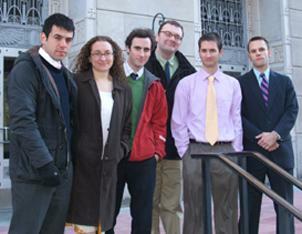 The activists were convicted under the Animal Enterprise Protection Act. The law has since been expanded into the Animal Enterprise Terrorism Act.